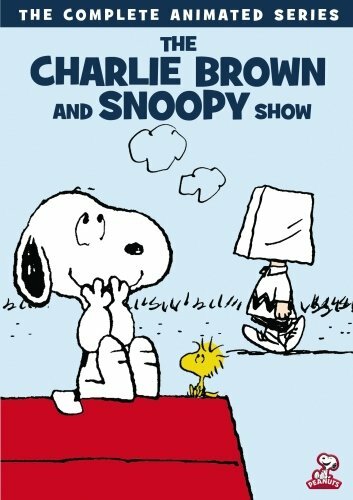 Article first published as DVD Review: The Charlie Brown and Snoopy Show – The Complete Series on Blogcritics. For reasons I’ll never understand, The Charlie Brown and Snoopy Show simply didn’t last long and aired rather erratically to boot. It seemed like a natural for Saturday morning programming. Each 22-minute episode is an adaptation of several Peanuts comic strips written, of course, by Charles Schulz. Unlike the better-known primetime specials, these episodes don’t tell one complete story. Each is a collection of several shorter segments, kind of like a variety show version a Peanuts special. Thirteen episodes aired in 1983, seemingly launching the series with a successful first season. The following year there was nothing. It wasn’t until September of 1985 that new episodes surfaced. Sadly, that second season was over after only five episodes, despite a 1986 Daytime Emmy Nomination for Outstanding Animated Series. It lost to Muppet Babies, the powerhouse that dominated the mid ‘80s with four consecutive wins in that category (1985-88). Individual episodes have dribbled out as bonuses on the Happiness is…Peanuts DVD series, each paired with one primetime special. In fact, five episodes have reached DVD in that fashion since mid-2011. But now, at last, Warner Archive has issued the entire run of 18 episodes as a two-disc set, The Charlie Brown and Snoopy Show – The Complete Series. It’s a blast for Peanuts fans, roughly the equivalent of getting 18 specials all at once. For anyone frustrated with the piecemeal releases Warner has offered heretofore, it’s a veritable mother lode. While nothing here is as iconic as the most famous specials (i.e. A Charlie Brown Christmas or It’s the Great Pumpkin, Charlie Brown), the series was consistently well-produced and entertaining. One cool aspect of the show is the music by Ed Bogas and Desirée Goyette. Some of the later specials that didn’t utilize the timeless themes composed by jazz great Vince Guaraldi had fairly cheesy scores that just didn’t evoke the Peanuts atmosphere. Though the second season featured a rather gaudy vocal version of the main theme, Bogas and Goyette came up with some stuff that managed to capture the more traditional jazzy feel. It’s interesting to note that a young Stacey Ferguson (better known as Fergie of the Black Eyed Peas) was part of the cast, providing the voices of Sally and Peppermint Patty in some installments. The episodes look relatively good. Actually, I have no complaints at all. The source materials were quite obviously remarkably clean. There are no bonus materials. A perfect inclusion would have been the 1988 mini-series This is America, Charlie Brown. I guess that will probably surface at some point as a standalone release. For now, Peanuts fans can rejoice that this fun series is finally available on DVD in its entirety. Charlie Brown has always been a great show.